Jimmy Floyd Hasselbaink is confident his in-form Cobblers team is capable of getting a positive result at high-flying Blackburn Rovers on Saturday. Town travel to Ewood Park (ko 3pm) to take on a Rovers side who haven’t lost in Sky Bet League One since mid-October, and haven’t lost on home soil in the league since September 16. Tony Mowbray’s men are unbeaten in 16-matches in league one, a run that has seen them climb into the automatic promotion places, as they finally overhauled early-season pacesetters Shrewsbury Town last weekend to go second behind leaders Wigan Athletic. Rovers are also the second top scorers in the league, and on paper the trip to the north west looks a daunting test, but Hasselbaink says the Cobblers are ready for it. “Blackburn were always going to be a team that is going to try to get promotion, but then you still have to go and do it, which is not easy,” said the Town manager, who has seen his team win three matches on the spin. “It is going to be a challenge, but it is one you have to take on and try to overcome. Blackburn are a very good side, and it is going to be hard, but it is a challenge you want to take on as a footballer. The Cobblers go into the game knowing they can compete with Blackburn though, with the two teams drawing 1-1 at Sixfields as recently as December 23. Hasselbaink is looking for a similar standard of performance to that one, and said: “That is in there, and we want to again keep it competitive, keep it a tight match, and try to take the game to them. “I know Tony Mowbray very well, and he is somebody who I respect. “He has done a lot in the game, as a footballer and also as a manager. He is a good manager and his teams always try to play a certain way. 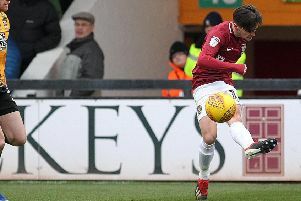 Rovers’ goal in the draw at Sixfields was scored by £500,000 summer signing Bradley Dack, and he has been their outstanding performer this season, but Hasselbaink insists they carry many more threats than the ex-Gillingham man. “Bradley Dack is impressive, but they have quality all over the pitch,” said Hasselbaink. Aside from injured defenders Aaron Pierre and Aaron Phillips, the Cobblers have a fully fit squad to pick from.